Guest editorial from Ross McKitrick that appeared in the Stratford Beacon Herald. Original piece can be read here. Anyone remember the Sprung Greenhouse fiasco? In 1987, Newfoundland Premier Brian Peckford attempted to boost local employment by subsidizing the building of a massive hydroponic greenhouse operation that its inventor, Philip Sprung, said would turn the province into a world leader in green produce. His plan had failed in Alberta, but in Peckford he found a gullible partner willing to abandon common sense and start signing over other people’s money. During the construction phase the premier pointed with pride to the hundreds of jobs apparently created. Meanwhile the province kept signing cheques and promising that cucumbers and economic renewal were on the way in equal measure. General Electric Co. announced Monday that it plans to harness the power of winds blowing across Lake Erie by developing the world’s first freshwater wind farm several miles offshore from downtown Cleveland. 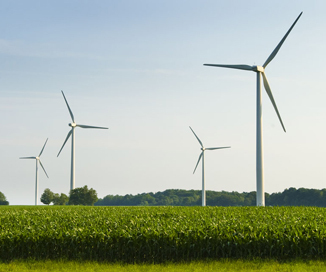 GE and the nonprofit Lake Erie Energy Development Corp., or LEEDCo, announced a partnership to develop five wind turbines about 6 miles north of Cleveland Browns stadium. The turbines, which would stand about 200 feet tall, would aim to generate about 20 megawatts of power by 2012 and 1,000 megawatts by 2020. The announcement came weeks after the Obama administration cleared the way for America’s first offshore wind farm in Massachusetts. In late April, U.S. Interior Secretary Ken Salazar approved a $2 billion Cape Wind project off the shores of Cape Cod after more than eight years of lawsuits and government reviews. While investment analysts are telling their clients to get out of solar power firms and warning about the continuing risks in wind and bioenergy schemes, Ottawa and the provinces are on a mad populist stampede to throw billions of dollars at the green energy monster. The politicians don’t seem to be keeping up with the trends. “Don’t try to catch a falling knife,” warned J.P. Morgan this week in a report that told investors the market continues to fall out of the solar panel module market. It downgraded a bunch of solar companies that have already been in a tailspin since the fist signs of a solar crash back in 2008. Other alternative energy sectors are hitting walls. Jurisdictions with wind power regimes face continuing issues related to the fact that the wind often doesn’t blow much, turning investments in wind farms into cash-draining albatrosses. In Ontario, the 1,100 megawatts of built wind turbine capacity are often running a few megawatts at a time, and even on the best of days have trouble producing 150 megawatts. Wind power is unreliable, expensive and doesn’t result in lower C02 emmissions. Why is Ontario still rushing ahead with it? In October 2007, the Ontario Power Authority (OPA) — the government’s own agency, tasked with planning Ontario’s power system and now entering into long-term contracts with renewable energy producers — published its Integrated Power System Plan, where it analyzed a “high wind power” scenario for the province, and concluded: “Since wind generation has an effective capacity of 20% compared to 73% for hydroelectric generation, additional generation capacity with better load-following characteristics would need to be installed. For an hour-by-hour comparison of generator output and capability, visit the IESO website. Scroll down to wind total. In particular for Elgin county, follow the meagre output from the Erie Shores Wind Farm near Port Burwell. 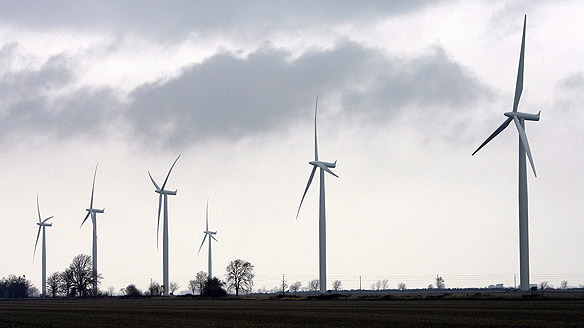 Will Canada’s wind turbines invade lakes? A proposal to put 700 wind turbines along the shores of Lakes St. Clair and Erie, each about as tall as a 40-story building, is provoking controversy in Canada and the U.S. The turbines, planted on the lake bottom and arranged in grids jutting more than 3 miles out into the lakes, easily would be seen from the marinas and mansions of the Grosse Pointes, as well as from Rockwood, Gibraltar and Grosse Ile. Some residents on both sides of the border are worried about how the windmills would affect shoreline property values, fishing, boating and bird migration. The turbines would be on major migratory pathways for birds at several major wildlife refuges, including Point Pelee, Ontario, and the Detroit International Wildlife Refuge. Wind Energy’s Ghosts – a warning about the perils of wind power. The sound floats on the winds of Ka Le, this southernmost tip of Hawaii’s Big Island, where Polynesian colonists first landed some 1,500 years ago. Some say that Ka Le is haunted — and it is. But it’s haunted not by Hawaii’s legendary night marchers. The mysterious sounds are “Na leo o Kamaoa”– the disembodied voices of 37 skeletal wind turbines abandoned to rust on the hundred-acre site of the former Kamaoa Wind Farm. What happens when politics displaces market forces in green energy initiatives? When driving through Don Quixote country in Spain’s Castille-La Mancha region, you are dazzled by the spectacle of wind farms proudly churning out the energy that will save Iberia and the planet, followed, once you cross into Andalusia, by solar farms and the green jobs of the future. Except that if things continue as they are in Spain, the world’s poster child for renewable fuel, wind and solar energy may not save us after all — or renew the capitalist economy.